A beautiful, leaf-lined vase holds vibrant flowers such as roses, spray roses, and carnations, button spray chrysanthemums, and more. 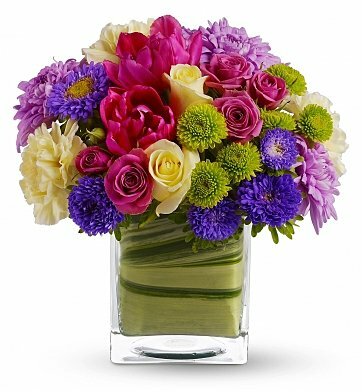 Rich in color and sweetly fragrant, this unique arrangement is a lovely expression of your best wishes. Standard Arrangement Measures 9" x 9". One Fine Day Bouquet is a hand delivered gift. These gifts are delivered by one of our local design centers located throughout the United States and Canada. Same day delivery is available for most gifts when ordered before the cutoff time. The cutoff time for One Fine Day Bouquet is 2 PM in the recipient's time zone. We ordered this arrangement for our niece who had had surgery and it arrived that same day looking beautiful. She said it really brightened up her day! I didn't get to see them in person, but the recipient sent me a photo. They were so pretty!! The colors were vibrant and it was a beautiful arrangement! We used a renown florist; FTD. What a brilliant mistake! Mom received the wrong boutique 3 days after Mothers day. She didn't receive her card either. In place of it was a cheap sheet of paper and you could forget about her gift!!! My husband and I wanted a refund; we got it 2 weeks later, because get this; They posted our funds to the wrong account. When My mom sent pictures of the flowers she received, I wanted to crawl under a table in the darkest corner of our house! even the water was dirty; As if someone scooped them from the side of the road from a dirt pond. To top it off, they had the nerve to come back a day later to retrieve their flowers! OMG!!! You have our business. AWESOME!!! SHE LOVED HER GIFTS AND THEY WHERE ON TIME! Thank you so.... much Gift Tree!